Happy Boys Day! Today in Japan is now called Children's Day. It used to be called Boys Day and we still think it should be so, since girls have their own day ;) It's only fair! For lunch Kidlet has cheese carp on a peanut butter sandwich. On the side are green beans, checkered apple, oranges, and pretzels. Here is Kidlet's Boys Day display! The cheese carps are very cute! How great the bento is! Perfect for Children's Day. 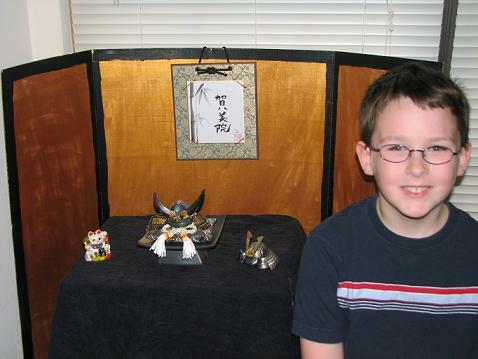 You even have those Kabuto display, cool! Happy boys day to kidlet! Nice bento to celebrate it. And nice Kabuto display! Wonderfully cool carp flying in the breeze! Really beautiful one, Jenn! Beautiful carp. Happy Boy's Day! Kidlet is a super cutie!!! Very cute! 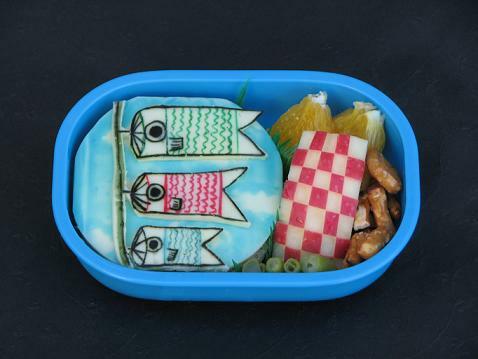 I've been so bad about observing holidays via bento this year. Good for you!